Former President John Dramani Mahama has promised the rank and file of the opposition National Democratic Congress in the Volta Region that their toil for the party will be amply rewarded in 2020 should the party be victorious. 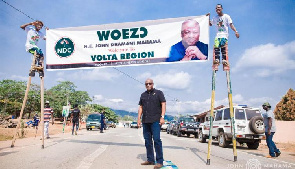 Mr Mahama who received a tumultuous welcome to the region arrived in Golokwati in the Ho West Constituency at the start of his six-day campaign tour of the Volta Region, the “World Bank” of the NDC. Addressing the delegates of the party, former President Mahama called for hard work from all executives and supporters to ensure victory in 2020, assuring them that they won’t be forgotten. He promised to work with the party and executives to ensure that hardworking members are rewarded and fully for their commitment and contribution to the growth of the party. Chiefs, queen mothers, community elders, constituency and branch executives supporters and sympathisers of the NDC gathered very early to welcome Mr. Mahama to the region. Across all the constituencies so far visited, including Afadzato South, Hohoe and Buem, the people of the region demonstrated their love and support for Mr. Mahama. Mr. Mahama also cautioned executives of the party against denying supporters opportunities in favour of their family relations and friends, noting that the hard work of all during the party’s days in opposition must be rewarded after the 2020 victory.